SAES exhibits their solutions in a shared-stand together to Navantia and offers a presentation entitled “New trends in naval mines”. 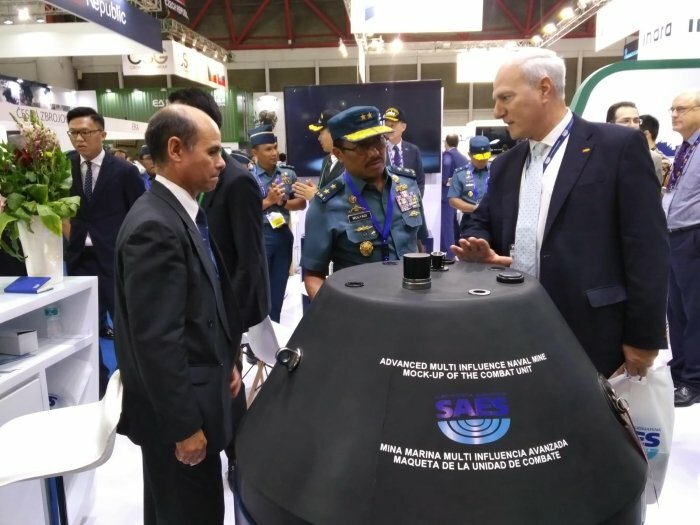 SAES has participated in the INDODEFENCE Expo and Forum that is held at Jakarta from 7th to 10th November 2018 and hosted by the Indonesian Ministry of Defence. The company has done technical product presentations to countries’ delegations that has visited its stand and has offered a conference aimed to deepen in Naval Mines knowledge. Indonesian Navy at SAES stand during a technical presentation of MINEA. TNI-AL’s Assistant for Logistics to the Navy Chief Rear Admiral Mulyadi and SAES’ Chief Operating Officer Mr. Adolfo Hernández. The challenge on Naval Warfare makes SAES to continuously develop solutions to face them. SAES naval mines are capable of being activated by magnetic, electrical or acoustic influences, improving the efficacy for protecting and controlling strategic areas, straits and other force-used maritime zones. In order to the military personnel being familiar with naval mines and understand concepts like multi-influence ship signatures, the company has developed a naval mine for training. This training naval mine allows to the crew knowing how smart naval mines work and how to prevent damage from them. SAES also offered specialized training for understand how the ships are “seen” by the mine or how the naval mines can be programmed. The family of MINEA products comprises three types of naval mines: cylindrical bottom mines, conical shaped shallow-water mines and moored mines. All of them use a variety of sensors to detect different physical influences. To program a smart naval mine it is needed to own signature intelligence of a ship, which includes the electric, magnetic, pressure, seismic and acoustic radiation. Besides MINEA training version, which can record and store this information, the company also offered a more specific system: MIRS.